A light curtain shields a hazardous area for people's access. When there is no access for persons, but the access for products must be available, a muting light curtain offers a perfect solution. With a muting light screen, access to a hazardous area is temporarily disabled (muting), allowing products to enter the hazardous area. 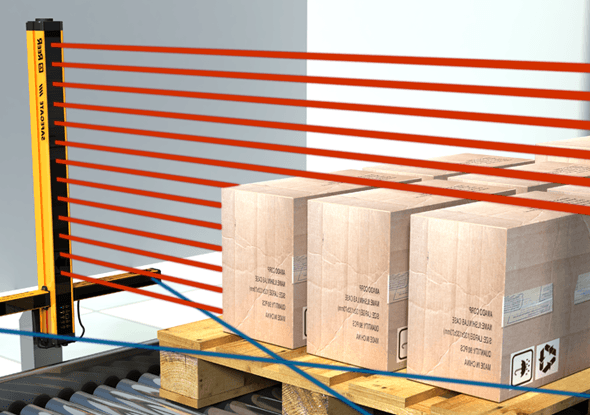 With a muting light curtain from ReeR Safety it is possible to safely import and export products in a T-arrangement. 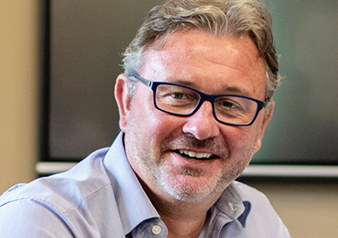 With an L-arrangement it is only possible to export products. If a person goes through the light screen, the machine will stop. In addition to T-arrangement and L-arrangement, it is also possible to apply muting in I-setup. Muting arms are quick and easy to assemble and are connected directly to the muting light screen via M12 connectors. The muting arms can be adjusted by the notch in the light curtain to the correct height and the correct detection angle. The position of the built-in sensors of the muting arms conforms to the IEC TS 62046 regulations so that the user can not make mistakes. With the standard muting arms it is possible to make a muting setup in L or T setup. With the 5 beam muting sensors you have complete freedom in setting up a secure muting application. 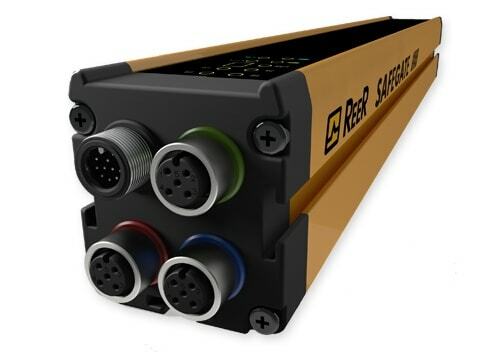 The 5 beam muting sensors are mounted in a robust aluminum arm so that they are mechanically protected. Position and angle can be adjusted if desired. 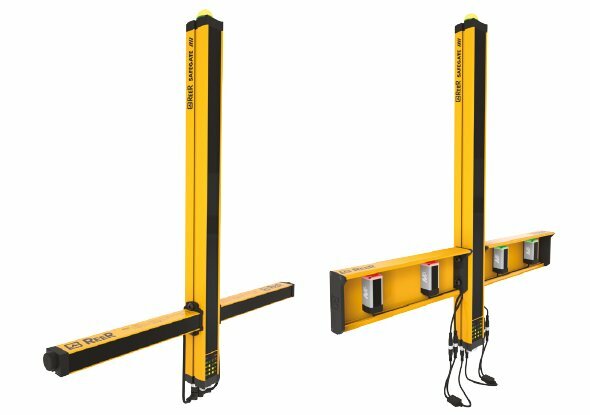 The 5 beams guarantee proper detection in difficult applications such as muting a pallet with openings or products with interspace. The M5 muting sensors are available as a transmitter, receiver and as a reflector version and are connected directly to the muting light screen with M12 connectors. The entire top of the sensor is equipped with a multi-colored LED so that the status for an operator is always clearly visible. The ReeR Safety Safegate muting light curtain series is available in three variants. The muting lamp that is standard on the muting light screen in the SMO and SMPO series indicates the status of the muting application. 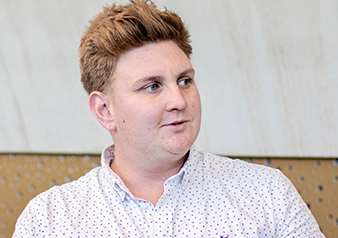 For people around the muting application it is always clear whether problems occur. The status lamp of the SMO and SMPO series shows the state of the muting application. For people around the machine it is therefore immediately clear whether the muting is working properly. If an operator has to reset the light screen or operate the override button, this is immediately visible via this status lamp. In the programmable variants of the Safegate, the secured height can also be partially muted. 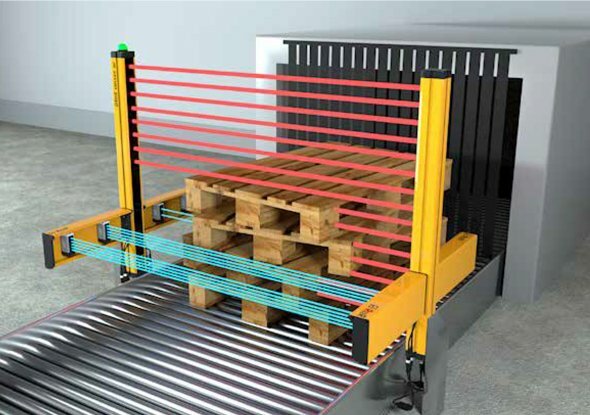 This ensures a higher safety level when a pallet is stacked only low. After all, the operator could easily enter the machine over the low stacking because the security was switched off during the muting process. When the light curtain is partially switched off, the upper safety light beams remain active during the muting. 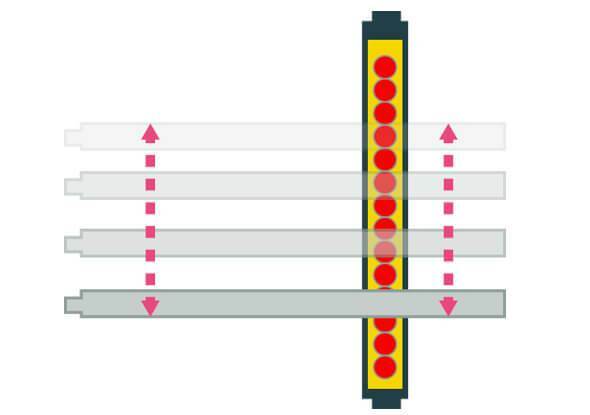 The muting arms or sensors are connected to the Safegate light curtain via M12 connectors. The connectors on the light curtains are color coded to prevent errors during connection. 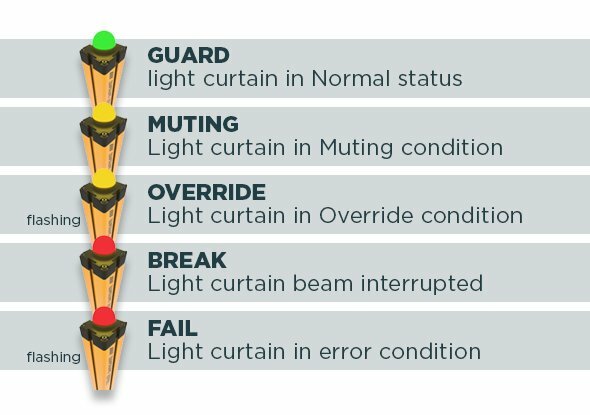 The connections on the light curtain have a color coding so that it is always clear how a muting light curtain should be connected. The blue and red surrounded connector are connections for muting sensors, the muting lamp is connected to the green connector. The muting lamp shows the status of the muting process. 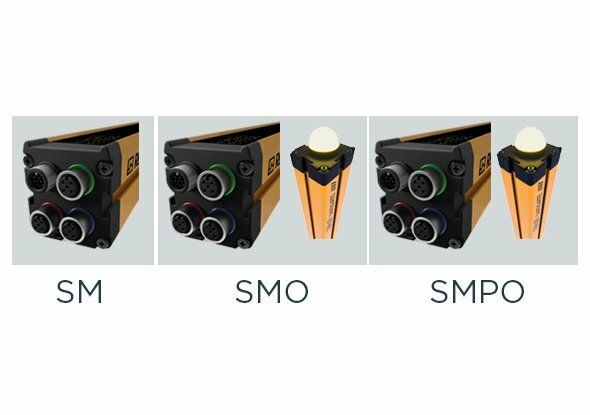 The SMO and SMPO series are equipped as standard with a muting lamp. A connection is also made with a PC via the green connector. This is possible with the SMPO series.